The new Wilson Staff Blades. If there's one iron model that rarely undergoes a yearly makeover, it's the traditional muscleback blade. Unlike a standard cavity-back model where the priority typically centers around picking up ball speed and a few more yards, blade users put a premium on hitting the same yardage as their previous set, feedback at impact and maybe picking up a touch more forgiveness — something that requires club designers to get creative with the creation process. For the last four-plus years, Wilson's FG Tour 100 — designed to celebrate the company's 100th anniversary — has remained the lone blade offering in the lineup. In Wilson's eyes, there wasn't a need to shake things up until a couple years ago when staffer Brendan Steele began working with R&D on the new Staff Model blades. For Steele, the goal with the Staff Model was to create a more modern profile without sacrificing performance. That meant adding a redesigned musclepad while maintaining the thin top line and compact look at address he's come to expect from the FG Tour 100. "This has been a labor of love for me," Steele said. "I've been able to be involved in the entire process and give my feedback, which is something I think is really unique to Wilson. The big challenge we saw was improving on a great blade; the 100th anniversary blade was the reason I joined Wilson in the first place." Designed with a similar shape to the FG Tour 100, the Wilson Model Blade is forged from 8620 carbon steel with a high polish mirror finish. The fluid feel hosel construction is a bore-through design that repositions discretionary weight while enhancing feel at the same time. 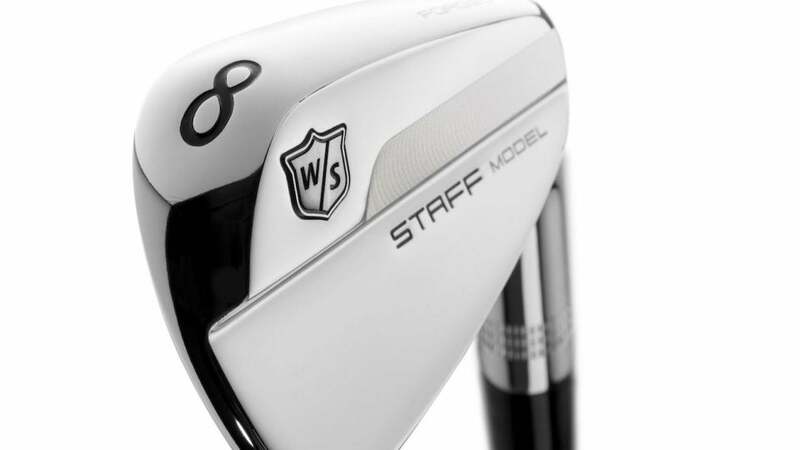 “By design, we crafted the new Staff Model irons to have a similar look as the FG Tour 100, which was critical as I continue to evaluate changes to my equipment,” Steele said. The face features textured milling for improved control and feel, and a milled diamond pattern that's meant to frame the score lines at address. In addition to Steele, Gary Woodland put the irons in play the end of last year at the Hero World Challenge when they were still a prototype. Woodland signed a 10-club deal with Wilson in January. Wilson's Staff Models blades (right-handed only) retail for $1,200 and come standard with True Temper Dynamic Gold shafts. Check out more photos of the irons below.